New Design, Two fun colorways! Some say she’s the sister of Robin Hood, others tell she’s the daughter of Joan of Arc. No one really knows for sure. What we do know is she is cloaked and hooded and lives in the shadows bringing good to mankind. 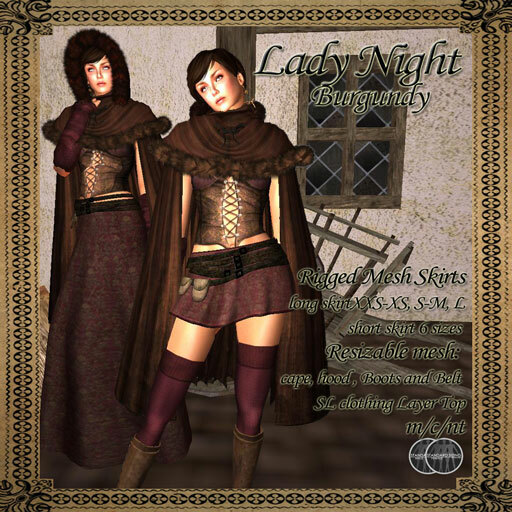 My New design is “Lady Night” it has two rigged mesh skirts, one long, one short. A cloak with scripted up/down hood, Leather moccasins, corset, leg and arm warmers to finish the look. It’s yours for the rest of the week for only 100L$. You have until Feb. 14th to join in the fun with the Winter Wonder land hunt and your gift from BMe will be the Winter Snow colorway. Please see sign at the BlueMoon enterprise shop on the grid of “Second Life” for information. We also have a new satellite shop on the Gorean Merchant Isles (GMI). Here we will sell both the beautiful medieval builds and the clothing. Next time your in world please take a look. I have a lot of news for this second weekend in January! Customer loyalty discounts, buy 1000L$ and you get 10% off anything. Buy over 2000L$ and you get 25% off EVERY THING any time! No expiration date. the vendor system keeps track so you need not feel you have to buy it all at one time! We now have a redelivery terminal in the dressform by the BMe Group invite. You can now buy BMe clothing as a gift. Join the BlueMoon enterprise group for a monthly group gifts, FREE. if I see anyone in world (not at the shop) with one of my dresses or my store tag on i’ll give them a 250L$ gift card. On the second floor you will find some affiliate group only gifts, these will change out weekly so take a look. On the design end, I have an exciting new outfit that will be released next week. I am also reworking the ever popular “Rhianna” dress with a new mesh under skirt and prim over skirt. I also have a new Victorian design dying to get out of my head. At BlueMoon enterprise the clothing is crafted with integrity of the time. All costumes are made with period correct fabric, trims, and construction. 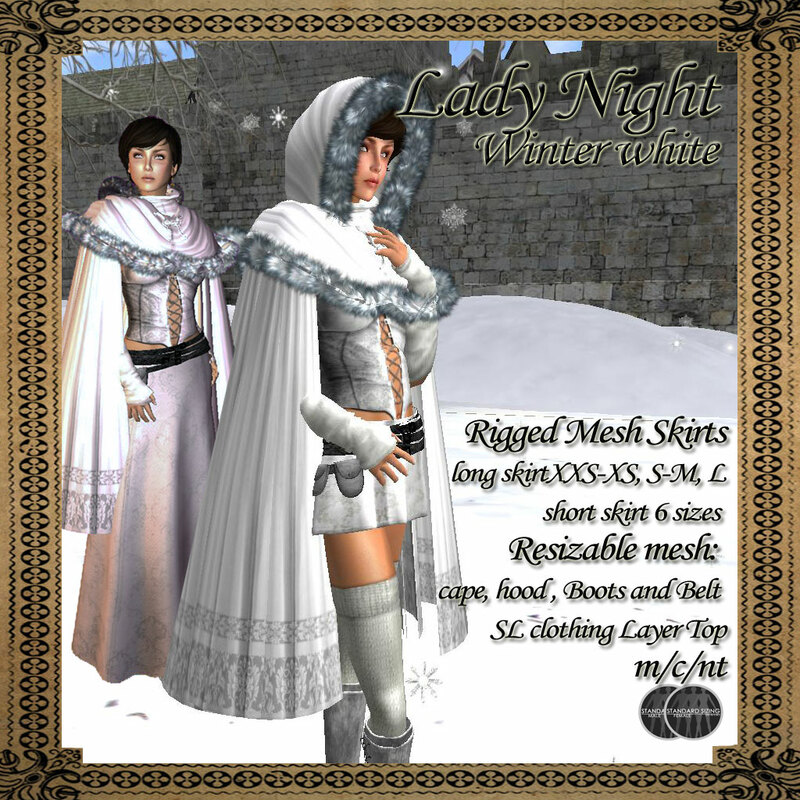 We offer styles from the Medieval through the Victorian eras, Made with SL texture layer, prims, scuptys, resize-able mesh, alphas and rig-mesh in five to seven sizes to ensure the perfect look.